WWE Payback 2015 is out on DVD and Blu-Ray now, available from wwedvd.co.uk and all other reputable DVD stockists. 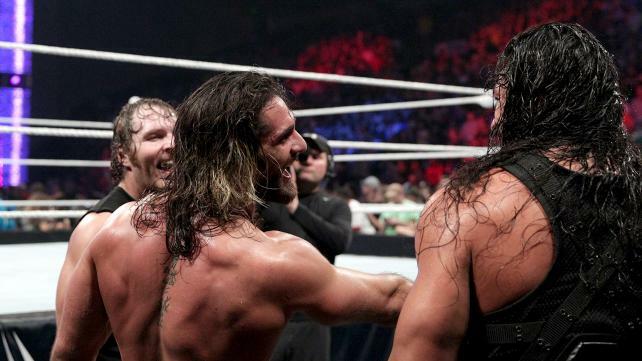 Broadcast live on Pay-per-View (and the WWE Network) from the Royal Farms Arena in Baltimore, Maryland, USA on 17th May 2015, the show features Seth Rollins defending the WWE World Heavyweight Championship in the main event against Randy Orton, Roman Reigns and Dean Ambrose in a Fatal Fourway Match. There's also six other matches featuring the likes of Cesaro, Neville, Dolph Ziggler, Bray Wyatt and King Barrett in action with stipulations including "I Quit" and Two out of Three Falls. The United States and WWE Tag Team Championships are also up for grabs. The disc includes over eight minutes of special features, including one further match. Michael Cole, Jerry Lawler and John "Bradshaw" Layfield provide the commentary. With a loud Baltimore crowd, Sheamus and Dolph Ziggler produce a strong opening match, with a high pace that works nicely as a closer to their two month feud. The New Day (this time Big E & Kofi Kingston, with Xavier Woods at ringside) keep the crowd hot with a belting Two out of Three Falls match with Cesaro & Tyson Kidd (with Natalya by their side) over the WWE Tag Team Championship, with all four men upping their game from their previous outing at Extreme Rules. Bray Wyatt colliding with Ryback is much much better than you would imagine, with both men throwing bombs, and some underrated storytelling, the match rounds off a fine first hour of the show. John Cena concludes his rivalry with Rusev (with Lana still present at ringside) over the United States Championship in a satisfying "I Quit" Match. The arena-wide brawl features plenty of big-time spots, that make this a true spectacle to watch, with Rusev's selling being a good little touch and grounding the match. A few slip-ups and a questionable finish prevent this contest from breaking out of the four Cena vs. Rusev matches WWE presented between February and May, but it's still worth a watch. Unfortunately the same can't be said for a Tag Team bout between The Bella Twins and Naomi and her new partner Tamina, which plays out in front of quiet crowd and features a weak closing sequence. The theme of unsatisfactory finishes continue as "The New Sensation" Neville and the newly coronated King Barrett battle in an adequate bout that never threatens to break out of the mid-card pack. Randy Orton makes up for the lengthy entrances (including Kane who continues to be featured heavily) for the main event with some lovely touches as his opponents are making their way to the ring. 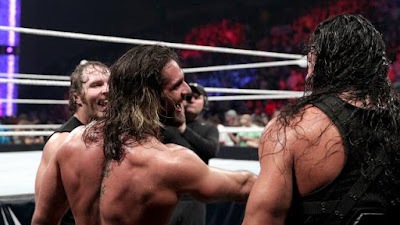 The Fatal Four-way works as a nice B PPV main event, with some quality storytelling throughout, as Seth Rollins defends the WWE World Heavyweight Champion against Orton, and former Shield partners Roman Reigns and Dean Ambrose. The crowd is into everything all seven men do (including Kane and J&J Security), with reaction to the interaction between the former Shield trio being particularly impressive, making this well-structured, well-paced bout just that little bit better. This is a solid B-Show outing for WWE, that starts strong with four quality bouts, and despite a little wobble at the end of the second hour manages to finish strongly with a good main event. The main complaint would have be that some of the finishes are not quite as strong as the rest of the content, but that's what we've come to expect from these kinds of shows from WWE, and with the WWE Network special, Elimination Chamber just two weeks away at the time, it's clear to see why WWE went down that road with this one. Certainly a stronger outing that the previous month's Extreme Rules, if it comes down to a choice between those PPV's on DVD, plump with this one.